Editor’s Note: This week we’re at the 232nd AAS Meeting in Denver, CO. Along with a team of authors from Astrobites, we will be writing updates on selected events at the meeting and posting each day. Follow along here or at astrobites.com. The usual posting schedule for AAS Nova will resume next week. 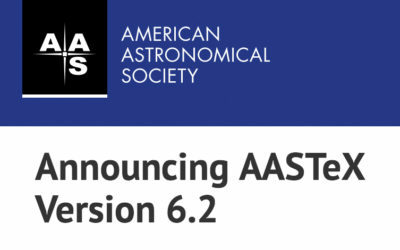 The sessions for this AAS meeting began with a workshop on using python to parse NASA data archives, organized by Vandana Desai (IPAC/Caltech) and the team at NASA Astronomical Virtual Observatory (NAVO). The resources are available at the following link: “https://github.com/NASA-NAVO/aas_workshop_2018_summer”. We would like to encourage all our readers to start retrieving multi-wavelength information from these rich exquisite datasets! This session, organized by Zoe Buck Bracey, PhD (BSCS Science Learning), focused around pedagogical techniques to be used in classrooms about concepts. This 4-hour workshop was full of mini-experiments, tasks and group work (along the ideas of “Think, Pair, Share!”), to encourage instructors towards building classes around concept “anchors”. The example studied throughout this amazing workshop attempted to teach the model of the Earth-Sun system and encourage understanding of seasons on our planet. We used average planetary temperature datasets as anchors, which allowed us participants to put student engagement at the forefront, encouraging students to come up with a model that explains why seasons occur. Throughout the activities, the emphasis was on students bringing prior knowledge into a class and how an instructor can enable them cross the bridge from having a partial idea of concepts to a complete understanding. Don’t forget to check out poster sessions at AAS 232 and talk with presenters! AAS President Christine Jones opened the day with a brief session welcoming attendees to this meeting and outlining some of the highlights that we can look forward to at AAS 232 in the coming week. She especially drew attention to the plenary sessions (don’t forget to check out our interviews with keynote speakers! 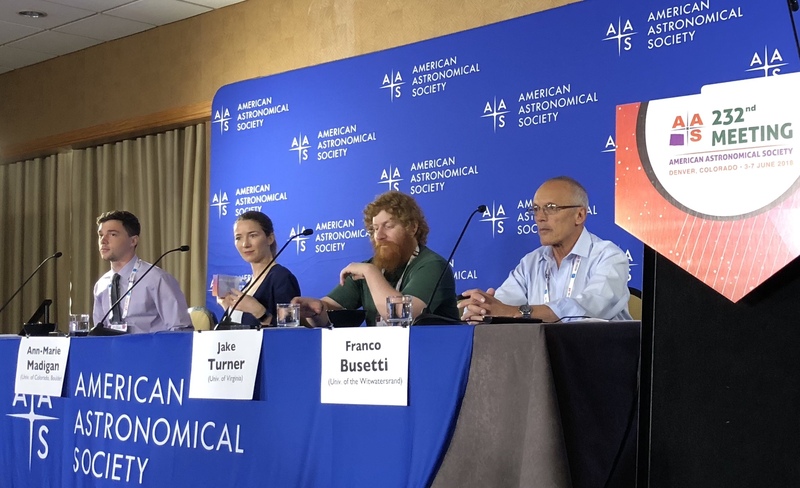 ), the town halls, and a few special sessions such as this morning’s AAS Taskforce on Diversity and Inclusion in Astronomy Graduate Education, which Gourav reported on below. 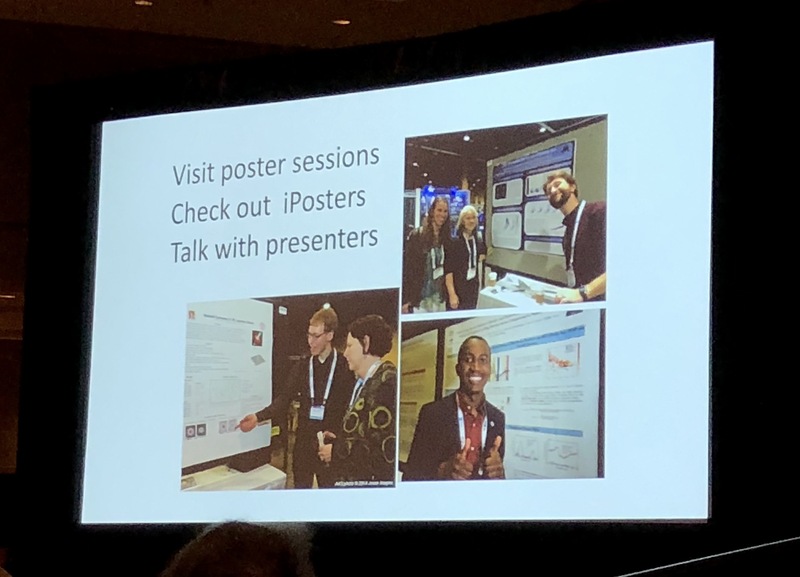 She also pointed out the value of visiting posters and talking with presenters — we appreciated the photos of students presenting their work at past meetings! Dr. Debra Fischer (Yale University) kicked off the plenary talks of this meeting by giving the Kavli Foundation Plenary Lectureship, an invited talk on “recent research of great importance.” Fischer’s opening comment — “It’s tough to give a lecture on exoplanets these days, because I know there are so many experts in the audience!” — acknowledged the huge boom that exoplanet research has undergone since its inception. Fischer, however, is a highly qualified expert herself: she’s spent more than two decades in the field, developing techniques for detecting exoplanets. Radial velocity, in which such a stellar wobble is seen in the star’s spectrum, as its spectral lines shift back and forth due to the approaching and receding star. This last technique, radial velocity, is the approach that Fischer has been working to improve. Thus far, the smallest radial-velocity wobble we’ve been able to detect is around 1–2 m/s, or roughly walking speed; Fischer hopes that in the future we can push this precision down to just 10 cm/s, a signal akin to the wobble that Earth induces in the Sun. This requires remarkable advancements in both technology of spectrographs and modeling of things like contamination of stellar spectra by Earth’s atmosphere — but Fischer and other members of the field are making significant progress in these directions! Fischer concluded by mentioning the many new and upcoming missions that will advance the field of exoplanet studies — like Gaia, TESS, CHEOPS, JWST, and WFIRST — and she threw in a sales pitch for the Large Ultraviolet/Optical/Infrared Surveyor (LUVOIR), a space telescope under consideration as a future NASA project. She also pointed out the broad community and general-public support of exoplanet science. The future of this field is bright! You can check out Stephanie Hamilton’s interview of Fischer here. 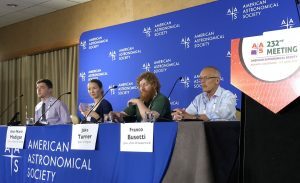 Panelists prepare for the first press conference of AAS 232. Intrigued by Tattooine? In the final presentation of the press conference, graduate student Franco Busetti (University of the Witwatersrand, South Africa) one-ups this sci-fi binary by discussing how planets might orbit around triple star systems. By running a series of orbital integrations — over 45,000 of them! — Busetti and collaborators showed that exoplanets can exist on stable orbits in substantial regions around triple systems. While only 40 or so planets have been found around triple systems thus far, we can hope that the Gaia and TESS missions will find many more. This AAS special session aimed to disseminate updates of the AAS Taskforce on Diversity and Inclusion to the membership. Kelle Cruz and Alex Rudolph began the proceedings with a description of the Taskforce, which was empaneled in November 2018, and is in the process of putting together a report on their findings via several of their initiatives. To look into retention and recruitment practices along all axes of identity. To build consensus on evidence-based practices across the community. To create and collaborate on a statement of best practices. To develop guidelines that help astro grad programs towards implementation of suggestions coming out of the Taskforce initiatives. To develop recommendations for ongoing data collection from astro grad programs. Inclusive Astronomy & Nashville Recommendations were brought up (read more about this here: https://astrobites.org/2017/12/25/building-an-inclusive-astronomy-community/). Partnering with institutions producing PhD-ready under-represented minorities could go a long way in bringing diversity and representation to departments. There is a need for implementing evidence-based, holistic approaches to admissions. Coordinating with campus offices regarding fee waivers, fellowship opportunities, GRE policies, and application contents is a priority. One of the priorities was facilitating an accessible and welcoming environment, ending harassment in and around astro workplaces, and supporting effective, evidence-based mentorship at all levels of astrophysics research. The working group is also involved in engaging departments in conversations, conducting assessments in your local environment, incentivizing professional development, taking actions, and monitoring progress on these actions. This working group’s priorities are built on baselines and progress in demographics and climate, as well as initiatives that provide accountability. There is a proposal to conduct climate surveys every 2 years, collect and report demographic data, and create a platform to collect data, analysis and decentralize information as soon as is feasible. What do gold, krypton, plutonium, and europium have in common? They’re all r-process elements, of course! Elements heavier than iron form through neutron-capture processes; when an atom captures a free-roaming neutron, the neutron will often change into a proton by emitting a beta particle (an electron, in this case). This leads to atoms bulking up into heavier and heavier elements over time. There are two neutron-capture processes: rapid (r-process) and slow (s-process), where the speed refers to the rate of neutron capture compared to the rate of beta decay. While all elements heavier than iron can be formed through both pathways, some elements (like gold and europium) are almost exclusively formed through the r-process. In today’s lunchtime plenary, Dr. Enrico Ramirez-Ruiz (University of California, Santa Cruz) described the importance of understanding r-process nucleosynthesis in the universe. While the basic understanding of how heavy elements form has long been known, the details are still unclear — especially in terms of what astrophysical objects produce them and in what amounts. In this talk, Dr. Ramirez-Ruiz focused on neutron star mergers as a source of r-process elements. Although neutron star mergers are rare, each collision can produce about a Jupiter-mass worth of gold — equivalent to the gold abundance of a million stars! Dr. Ramirez-Ruiz used a tasty metaphor to explain the relative contributions of Type II supernovae and neutron star mergers to the cosmic r-process abundance: while Type II supernovae spread a thin layer of r-process elements fairly evenly across a galaxy like a layer of chocolate coating on a cookie, neutron star mergers generate huge amounts of these elements in random locations — like the chocolate chips in a chocolate chip cookie. This unevenness in heavy-element production helps to explain the huge variation in europium abundance (europium is almost exclusively made through the r-process) relative to iron in old stars. While we still need to know more about how heavy elements get mixed throughout a galaxy, studying and modeling neutron star mergers can help us understand the origins of very heavy elements in the universe. Be sure to check out Mia de los Reyes’ interview with Dr. Ramirez-Ruiz here! This led us to Coil’s main topic: the connection between galaxies and dark-matter halos, and what this can tell us about these cosmological parameters. The way galaxies cluster can help us do precision cosmology to constrain these parameters. This is because galaxies trace the underlying dark-matter distribution of the universe, sometimes called the “cosmic web” (see tweet below). The challenge is then connecting our observations of galaxies (especially from galaxy surveys like DEEP2, which mapped out the positions of galaxies out to a redshift of z~2) with our theoretical understanding of the cosmic web (particularly cosmological simulations like the Millennium Simulation). As Coil described, one way we can bridge this theory-observational gap is by using the halo model. This model reasonably assumes that more massive halos host more massive galaxies, so that we can use a technique called abundance matching to match halos with their associated galaxies. “This is a very, very successful model,” Coil pointed out. We can also figure out what other parameters affect the clustering of galaxies. It turns out that the clustering of galaxies depends on several parameters: more luminous/massive galaxies and redder galaxies are both more strongly clustered than less luminous or bluer galaxies. Also, older halos are more strongly clustered in a phenomenon called assembly bias, which might be required to explain an effect called galactic conformity (how galaxies at the center of a halo appear to influence the star formation rates of galaxies in another halo). Understanding all of these effects is vital for understanding the close connection between galaxies and halos. Coil concluded that in order to do this, theorists and observers need to work together to do precision cosmology and interpret the results!